Designed, engineered and assembled in our factory in Cornwall, the Doxy is the UK's long awaited answer to the now discontinued Hitachi Magic Wand. In a market flooded by cheap – and often dangerous – imitations, we wanted to reclaim the reputation of the mains-powered wand massager. 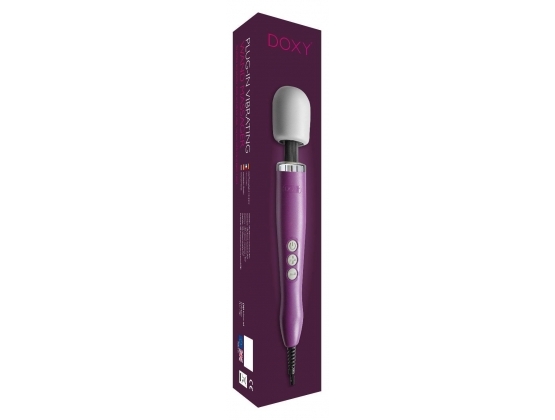 Wanting to offer our customers more, Doxy is the only wand massager with a controlled pulse setting. Taking the rumbly vibrations from low, to high and back again and at variable speed settings, it adds a whole new dimension to your experience. Finding what works for you is all part of the fun, which is why the Doxy is ideal for women and couples ready and willing to explore the different levels of arousal. Only quality materials have been used in the production of our massager and safety is at the forefront of its design. The soft head covering is made from a hypoallergenic medical grade material that is free from latex or undesirable phthalates. Furthermore, Doxy is one of only a handful of mains-powered adult products fitted with a plug top power supply unit (PSU), meaning a low DC voltage travels into the massager. Not only does this make it completely safe, but it means that your Doxy can be used all over the world. Doxy offers women and couples a level of quality and sensation currently unrivalled by any other wand on the market.